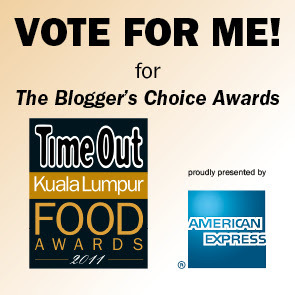 I don't know why, but I've been shortlisted (along with NINE other Food Bloggers that I am in awe of) for the TOKL Food Awards 2011 Blogger's Choice Award. Or if you just want to vote for your favourite restaurants in the various categories, you can also head on over to the TOKL Food Awards 2011 voting website"! It would seem that everyone knows best, especially when it comes to food, and that person is Malaysian. The top contenders on the list of Malaysian "I know best" foods (in no particular order) are Roti Canai, Char Kuey Teow, Assam Laksa, Curry Mee and Nasi Lemak. I love all of these, but it is Nasi Lemak, despite the offputting name** of the dish that really hits the spot when I am craving for some soul soothing, carby food. My favourite place for Nasi Lemak is a relatively famous eatery in the Damansara Utama area (aka Damansara Uptown) - Restoren Village Park. I am not alone in this, as it is constantly packed, even after it extended its premises to the shop lot next door. Many may scoff and say that it’s overrated, but I find nothing to dislike about the Nasi Lemak (RM 7.70) there - fragrant granules of rice (more al dente in texture than moist though), topped with a yummy piece of fried chicken which consistently has tender, well marinated meat and crispy skin, complemented by the slightly sweet and mildly spicy sambal on the side. Their main menu is not very extensive, with only a handful of other dishes like Soto Ayam (RM 6) and light bites like Roti Bakar with Butter & Kaya (RM 2.20). My favourite (when I'm not in the mood for Nasi Lemak) is the Assam Laksa (RM 6). The broth is light and smooth in texture but packs a wallop on the tastebuds - a nice mix of sour, salty, fishy (in a good way) and spicy. Another huge crowd puller is the array of different dishes that they serve displayed a la nasi campur/nasi padang in a big metal cart near the main doorway – a fairly wide selection of meats, veggies and seafood prepared in rendangs, curries and more but I have never braved the constant queue to try it. So whether or not it really is the ultimate, best Nasi Lemak in the whole of Malaysia, Village Park will always have a special place in my heart - It is the place that I pig out with my mum during our quality weekend time, the place I bring my overseas friends to tantalise their tastebuds, the place I used to eat with my ex, the place where I’ll always go back for more. Seriously, I'm so stoked just to be shortlisted!!!! 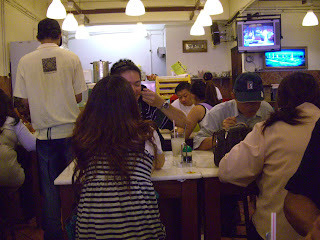 waaa, congratezzz!i love the nasi lemak here; esp the fragrant fried chicken! Wahh you mean 4 only??? Congrats!!! I feel honoured too :p other then both of us and Meena, who is the 4th blogger?? To Ai wei: Thanks! :) I feel like such an underdog tho - the other bloggers shortlisted are so famous/talented! CONGRATS on your winning entry! Saw the list of winners for each category & noticed your blog right away!! *woots! * Keep up the good work!! Awwwww. Thanks :) *blush* I'm still in shock actually.